I know we discussed tongs here awhile back, kind of forget what all was covered. Will start building a wheel arch this coming month and will need a tong for hauling and lifting the log. First question: All tongs seems to come with a warning; NOT FOR LIFTING. Would this apply to a wheel arch? Third Question; do you folks grind and sharpen the hook tips to make them function properly or does this really matter so much? Ive been using the same set of tongs for 30 years and they are likely 80 years old.Im guessing they are around 26 inches tall, i know they are 1.25 inch stock,real good steel. Theyll pick up down to about 8 inches reliably,less than that they tend to be dropsy. I can lift a 24 inch log easily, but the tongs are at max spread and can bend easy that way. If the log is real heavy I try to do one end at a time,or use a strap.I sharpen them occasionally like maybe every few years.I(f theyre sticky sharp they do grab hold better but are more difficult to get off the log by jiggling tooth sucking etc. Once the tongs are bit in its immaterial how sharp they are. Ill measure them tomorrow. I hang them on a piece of 3/4 chain and find I rarely have to manually set or unhook them.Practice does help. What Coastylogger says.I've had a pair of tongs I bought from Belsaw when they were in business must be 35 yrs ago,the good ones last forever.Any tongs that are reasonably priced have that warning just means their not approved for overhead lifting.Some tongs are approved but are very expensive with the pedigree tag on them.For what you want to do the nonhoists will do fine.Never bothered to sharpen mine but it won't hurt anything to keep them pointy.Frank C.
The arch on tongs is just as important as the hook arch on a cant hook. Flimsy tongs will spring out with a heavy log and some may actually bend. Heating and re-arching is tricky because of the temper of the metal. As has been previously mentioned, tongs that are 50+ years old were made for work. Sadly, most of today's tongs were made in China, and made to sell, not handle a load. The tongs on the right will not spring out and loose their shape. Thank you for your replies. Magicman, Now i see the REAL difference, your tongs are a lot better shape than the ones at my local store. Larger and well angled points. Have advertised on craigslist in my area for several months with no replies. I will keep looking for a real set!! These do a good job. 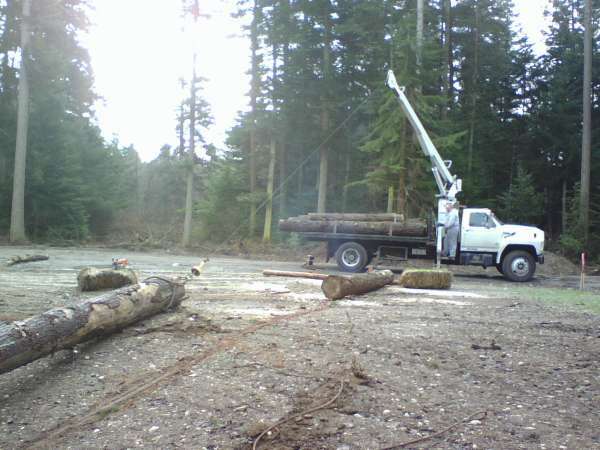 I lift logs off of trailers and skid with them. Never been sharpened. I see two hooks on chains hanging in your photo, what do you use these for? Those are my "End Tongs" used for unloading logs and adjusting logs around the sawmill. I made them from broken logging tongs. I use them to unload and move logs. Adjusting a 20' log on the sawmill using the roller toe boards and side supports. Adjusting a log using the sawmill's log clamp. 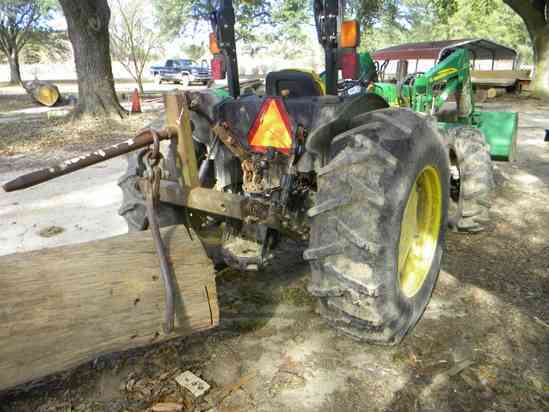 I like that half tong with the sawmill winch. That was always work getting the log moved square to the mill let alone the challenge getting the log to roll up the ramps. I have 3 tongs, but only 1 sees any real use. Slight differences in the angle on the hook, the curve of the tong, and the length of the hook make one easy to use and another very difficult. If possible find someone nearby that has a set of tongs that work well and make a template to compare to one you are thinking of buying. I have a small set I got many years ago. They are too small to be useful and the hooks are too short. The other 2 I got from a local sawshop about 3 years apart. The first is a 25" tong. It has blue paint like the Logrite cant hooks, but no name on it. The second is red, but faded quickly to pink. The second is a 32" tong. I use the 25" tong to skid logs from 10" to 36" in diameter. It works great. The points were sharp when I got it and have not done a thing to it. I never once worried about bending the tongs, but a 40 hp tractor is a good match for these too. I tried to use the 32" tongs and had nothing but problems. The arch of the tong seems to be a little less that it should and that keeps the points from digging in and the points are a little short. The points also seem to be very slightly off from the ideal angle. These were new tongs or I would have thought they might have been bent before I got them. Regarding "not for overhead lifting" I think tongs with a chain hook are always consider in that category. Some tongs have a ring instead. I prefer the chain hook to work with. I'm sure CYA has a lot to do with the declaring the not for lifting, but knowing people will use them however they want. I bought a used set made by I know not who a long time ago. There plenty heavy and work well although I did break one side…doing something stupid. A few years later I bought a second set at auction just because they were cheap. Still had a shipping tag and they were sold by TK. They are heavier than the first set and about the same size. They have one big advantage over the first set in the range of log…really small to big. I saw a set in TK last time I was there so I assume they still sell them. I can recommend them highly. That is terrible, but many good tools have fallen because folks had no use for them and modified their use. I remember that my Brother got the hooks from our old peaveys and we used them for fence staple pullers. It seemed like a good idea at the time. Maybe someone can elaborate more on skidding tongs and lifting tongs there is a difference in shape. 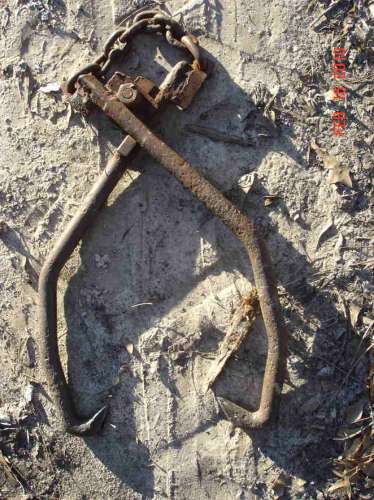 The tongs Bouge Chitto has on his tractors 3 pt look like lifting tongs. in this pic iam using lifting tongs for skidding NOT recomended. Idont do this any more. I picked up a nice skidding tong at store Optics guy mentioned they are 1/3 the price the lifting tongs are. TK dose sell both and they are USA. When I ordered it said on the label, not for lifting. I do lift with them tho. Don't know what a person could do with tongs that didn't involve lifting. I make my own tongs. Use them for lifting, skidding, and anything else I need tongs for. These are made from big truck tie rods, good quality steel. Heated with a torch and bent to shape, then ground the points off sharp. Notice the angle of the points, that's fairly critical.. Check our sponsor Bailey's- They have lifting tongs. I bought a set of tongs (probably Chineese) at one of those shopping center Tool stores up in Pigeon Forge, TN during a trip to dollywood. They work pretty good. I wish I had bought two. Using on my log arch and picking up 24 inch X 16 ft logs and not bending/breaking. The Dixie Mfg tongs are made in America and are very high quality. I believe that they are the same ones Logrite uses. Help out kids at the museum! Difference between ice tongs and skidding tongs? skidding tongs or lifting tongs?